Today nominations open for DogTime Media’s Unsung Hero Award. The way it works is really simple: If you know a shelter or rescue volunteer who deserves special recognition, tell us a little about that person. The winner (chosen by a select panel) will be honored at this year’s Petties. And, the honoree chooses an animal shelter or rescue to receive $10,000 on his/her behalf. That’s right: ten thousand dollars. The Unsung Hero is an award I’m particularly proud of DogTime for founding. Volunteers are vital not just to the operation of a shelter, but to the well-being of the animals housed there. So maybe you know someone who’s gone to incredible lengths to help a forgotten dog or cat, someone who has saved an animal in a particularly courageous or remarkable way. We want to hear their story. Or maybe you know someone who day in, day out, strives to make life better for the many lonely and confused animals who don’t yet — or may never — have a home. Their heroism isn’t sensational or high profile. It’s just a consistent, tireless dedication that isn’t eroded by the endless need for more. If I wasn’t affiliated with DogTime, I can think of many individuals I’d be likely to nominate. 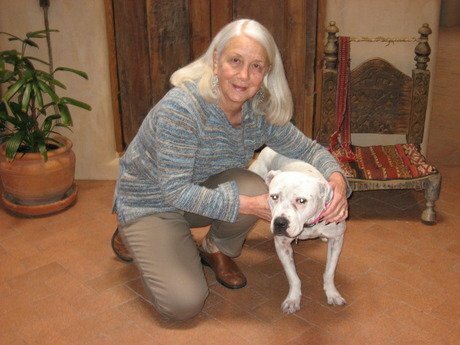 Ann, in addition to the hours she spends at the shelter each week, regularly fosters dogs no one else is up for taking. She has a soft spot for the mangy, down-on-their-luck Pit Bulls, and insists that with a little effort, these pups would blossom. They do — many have found permanent families thanks to her devotion. Judi and Sarah Jo have spent countless Saturdays with San Francisco’s Give a Dog a Bone program — a physically and emotionally draining commitment requiring weeks of training to ultimately be able to work with animals in long-term shelter care. Without its volunteers, Give a Dog a Bone dogs would literally face weeks or months alone in a kennel —no walks, no mental enrichment, and no companionship of any kind. Before she moved out of state last month, Karen showed up at the Espanola Valley shelter nearly every single day — the definition of an unpaid staff member. She walked dogs for hours on end, she helped out in the clinic during spay/neuter drives, and she made the rest of us volunteers feel like we were part of the team. Whenever the shelter has had need for a particular volunteer role, Martha has stepped up to fill it. She’s worked adoption fairs, she’s transported dogs across town, she’s walked adoptables and strays, and she still makes time to help the small, lesser-known rescue groups in the community. Her Facebook wall is an endless stream of posts featuring animals in need and shelter events. I could go on and on and on, but now it’s time for you to submit your stories. Good luck to all. And thank you.